The sierra is easily crossed by a circuitous route a little farther north which finally takes one through a natural pass. Coming out on the western side, that which appears most striking is a picturesque sierra rising boldly from among the great sand dunes to the south. It looked deep blue in the hazy and calm afternoon as we began to leave [Tinajas Altas] behind…. The next morning…I saw sunshine by refraction…. The sun shone into my tent…for at least twenty-three minutes before it rose, and the moon was bright at the same time for five minutes. Carl Lumholtz, New Trails in Mexico. Mile 0.0. 32°19’33.4”N, 114°02’59”W. Key Junction for Tinajas Altas Pass. From sign A-16, go southwest through the pass. (If you just came from Tinajas Altas, this may seem like you’re retracing your steps for 50 yards, but this is the route shown on the Goldwater Range Map and it simplifies your trip.) Early travelers used this western route to reach Yuma more directly. The road north goes to Wellton. The leg to Fortuna and Yuma is dippier, sandier, rockier, and more wash-boarded than the route to Wellton, but it also feels more like the “old” Camino del Diablo, wilder and with less traffic. Mile 0.2. 32°19’29.6”N, 114°03’13.8”W. Junction A-15. Take the better road west (left), heading through the mountain. As you go…. Miles 0.6 to 0.9: Tinajas Altas Pass. Heading west, the foothill paloverdes on the hillsides are probably the last you’ll see en route to Yuma; mainly the blue paloverde survives in the hyperarid desert ahead, both along drainages and on the slopes. This is unexpected and not typical in most of the Sonoran Desert, where blue paloverde flourishes along water courses and in deeper soils while foothills paloverde prefers drier hillsides and bajadas. Apparently the crest of the Tinajas Altas range creates a summer rain shadow, disfavoring the west side. Similarly, triangle-leaf bursage has given up – westward, you’ll find only white bursage, because triangle-leaf requires summer rains as well as winter rains, but white bursage does not. The desert west of the Gila and Tinajas Altas Mountains receives an average of only 2 to 3 inches a year, most of it in winter. Rocks and granite slopes to climb and play on. Campsites. In the evening, even in cooler weather, your camp may be visited by any of several species of insect eating bats that roost in crevices, caves, and old mines. These may include pallid bats, big brown bats, leaf-nosed bats, California myotis, and canyon bat, the most common species in this region. Too, lesser nighthawks fly at dusk hunting insects. The presence of bats is a sign of a healthy ecosystem. As you go…. 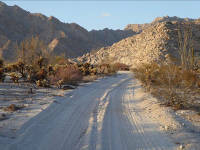 Miles 1.1 to 1.6: Look for bighorn tracks in sandy washes and roadway where they cross from one mountain to another or feed on plants along the washes. What is here for them to eat? Among their favorite foods are leaves, twigs, and flowers of ironwood, paloverde, catclaw, fairy duster, Mormon tea, burrobush, ditaxis, and ocotillo; cactus, such as fishhooks and barrels; a variety of grasses; and forbs such as mallow, Indian wheat, and filaree. Their diet consists of roughly 1/3 grasses, 1/3 browse, and 1/3 forbs as seasonally available. Most of these are available in the valleys or mountains around you. Mile 2.3. View ahead of distant Gran Desierto and its sand fields. The Colorado River begins its journey in the Rocky Mountains of Colorado and for eons brought sand and silt downstream, leaving us the Glamis Dunes, Algodones Dunes, Yuma Dunes, Gran Desierto, Colorado River Delta, and the exceptionally rich soil of the Imperial Valley and Yuma Valley. Major tributary rivers bringing the sand and silt are the Green, San Juan, Little Colorado, Virgin, Bill Williams, and Gila rivers. Mile 2.6. 32°18’45.7”N, 114°05”16.0”W. Key junction. Y junction. Turn northwest (right) at sign A-14. This road trends northwest for many miles, roughly parallel to the mountain spine. 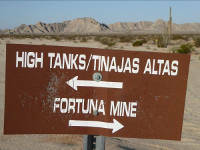 A “Camino del Diablo – Fortuna Mine” sign may point this way. The other road, closed to the public, goes south to the border fence. Before you lies a “different” desert, one with more sand, flatter ground, and plants growing father apart, relying on less precipitation. Visually it lacks the nearby mountains and peaks, and the light and colors appear different, perhaps from humidity of the river valley or smoke drifting from field burning. Nearby are creosotes, limberbush (Jatropha cuneata), ocotillo, a few saguaros, and spacious open flats. The Spanish name for limberbush is sangrengado, a contraction for sangre del drago – dragon’s blood, because it “bleeds” reddish sap when injured. It is a member of the large spurge family, and its stems have been used by Native Americans for basketry. Mile 2.9. 32°18’38.7”N, 114°05’33.6”W. A rescue beacon. Continue around the tip of the mountain and go northwest. Mile 3.9. Campsite, surveyor’s benchmark, and rocks. Surveying in the desert can be challenging in unusual ways, including the effects of heat on the men, and shimmering heat or mirages distorting accurate readings with their sextants. As Lt. N. Michler, boundary surveyor in 1855 reported, "The heat had become so great as to compel us to operate entirely with signal-fires by night." As you go…. Miles 4.8 to 5.0. Campsites. Large bare flats at edge of mountain and next to sandy washes. As you go…. Miles 5.3 to 5.4: Fine examples of teddybear cholla and cryptobiotic crusts. The crust helps hold the thin soil and scant moisture for the cactus. Many of the dust storms experienced in Arizona originate from unplanted farmlands or construction sites, not the open desert, which is largely held in place by this biotic crust. Interestingly, the weathercaster word haboob is Arabic (habub, gale wind), one of many we borrowed into English. Others include monsoon (mawsim, for season), adobe (at-tuba, brick), alkali (al-kahli, alkaline), caravan (qairawan, a convoy), candy (qandi, sugared), cotton (qutun), and coffee (qahwa, coffee, with mocha coming from the name of a Yemen seaport). One of Yuma’s most interesting citizen’s ran camel pack-trains to mines near Dome. Nicknamed Hi Jolly, he brought camels to the U.S. from Turkey as part of Lt. Beale’s experiment to use “the ships of the desert” in the American Southwest to carry military supplies. His Arabic name was Hadj Ali. And if you began you trip in Ajo or Organ Pipe, you may have seen references to Kalilville (the name for Lukeville at one time) or signs for Alley Road or Tom Alley Courthouse. The Syde Kalil family – Ajo stalwarts – hailed from Syria about 1900, and the Judge Tom Alley’s grandfather was Turkish and originally named Muhammad Ali – while passing through England on his way to America he changed it to Alley. Gary Nabhan’s book Arab / American: Landscape, Culture, and Cuisine in Two Great Deserts tells us more. And if you return home through Dateland, Arizona, stop in for a date shake made from medjools. Mile 5.4. 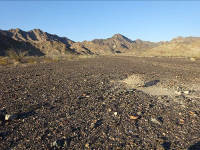 Campsite at end of a ridge and next to a wash. At any of your camps, you might take a close look at the dark soil crust. If you examine a teaspoon scoop of it, you may notice that the grains of sand are held together by sheaths of cyanobacteria, and that the grains may be tinged with green algae. If you wet a saucer-sized area of the crust, you may actually see it turn greener within hours, a miracle of rejuvenation. Biological soil crusts are a complex mosaic of living organisms – cyanobacteria (formerly called blue-green algae), green algae, lichens, mosses, liverworts, bacteria, and fungi – that weave throughout the top few millimeters of the soil surface. If you had a microscope in your trique bag, you could see a circus of small invertebrates such as protists (e.g., amoebae, ciliates, and flagellates), nematodes and microarthropods (e.g., mites, tardigrades, isopods), macroarthropods (e.g., tenebrionid beetles, termites, and ants), and bacteria and fungi, all relying on the crust for food and shelter. Grazing by protozoas stimulates cyanobacterial nitrogen fixation. You can see why ecologist Jayne Belnap calls the crust BOB, for Bio-Organic Buddies. Don’t crush Bob! A Border Patrol road runs east-west about 50 yards north of here. Mile 5.6. 32°20’19.1”N, 114°06’42.3”W. Sign A-13 for a trail that goes eastward. Gardenesque: large limberbushes (Jatropha cuneata), creosote, some velvet mallows (Horsfordia alata, Horsfordia newberryi), ocotillos (Fouquieria splendens ssp.splendens), ironwoods (Olneya tesota)… and dozens of trees and cactus that have died between 2005 and 2015 for lack of moisture. Keep going north. Mile 6.0. Sign A-12. Keep straight on main road. Mile 7.1. Campsites beside mountain, with open desert to the west and short walks along base of the ridge or into the flatlands. At sunset it is easy to imagine oneself on the shore of a western sand sea. Or a West Coast beach. As you go…. Miles 7.2 to 7.4: Stressed, dying, or dead plants. How can you have a drought in a desert, which is already dry and hot? Desert plants are accustomed to scant and unpredictable rains, but they still need water. When they are forced to contend with warmer and drier times year after year, they fail. Although many of the elephant trees are still standing, they are brown and brittle. Wood may decay slowly in the dry desert – even termites require moisture to make their tubes and digest cellulose. By some accounts, an ironwood may live 300 to 600 years, but accurate dating is difficult because their growth rings indicate rain cycles, not annual seasons, and may be missing or incomplete. Their dead heartwood spars may endure many hundreds of years – one was dated to have stood 1,600 years after it died. The wood is quite dense and will not float in water. The ironwood tree may reach a height of 45 feet, and many species of birds are known to nest among its branches. In the nitrogen-rich soil beneath the tree – a nitrogen fixing legume – researchers such as Gary Nabhan have documented more than 250 species of desert plants growing from seed. The Spanish name is palo fierro, meaning iron wood. 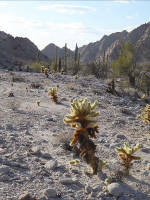 Ironwood Forest National Monument, northwest of Tucson, is another place you may wish to visit. As you go…. Miles 8.6 to 9.8: An unusual community of ocotillo, creosote, brittlebush, white bursage, some chollas, but no trees. For a short time in the 1970s, 80,000 acres of land surrounding Tinajas Altas was part of the Cabeza Prieta National Wildlife Refuge, extending the refuge nearly to the Butler Mountains. Botanist Richard S. Felger and co-authors have published a “flora” (a detailed and thorough plant list) for the area. You may find it on-line under the title “Flora of Tinajas Altas, Arizona – A Century of Botanical Forays and Forty Thousand Years of Neotoma Chronicles,” Journal of Botanical Research Institute of Texas, 2012. Another “flora” for the entire Camino del Diablo is available on-line at Felger, R.S. and S. Rutman. “Ajo Peak to Tinajas Altas: A flora of southwestern Arizona,” see items 3 through 23 at Research Articles on the Flora of the Sonoran Desert. Mile 10.1. 32°22’48.4”N, 114°10’19.3”W. Sign A-11. Go straight (northwest). Cross trails are closed to the public. The Butler Mountains lie to the west in a restricted area. They are a small, very arid, granitic range with their slopes partially buried by drifting sands. The range was named by geologist Eldred D. Wilson for Gurdon Montague Butler, dean of College of Mines at the University of Arizona (1915-1940) and director of Arizona Bureau of Mines (1918-1940). An important packrat fossil-midden study in the Butler and Tinajas Altas mountains by ecologist Thomas Van Devender found that prior to 11,000 years ago these hills sported Joshua trees (Yucca brevifolia), single-leaf pine (Pinus microphylla), California juniper (Juniperus californica), Mojave sage (Salvia mohavensis), and other cooler climate plants. The summit benchmark is at 1,169 ft. Ahead you can see the jagged ridgeline for Vopoki Ridge, part of the Gila Mountains. Vopoki is an O’odham word for “lightning,” though it was named by Wilson. The pass separates the Tinajas Altas Mountains from the Gila Mountains, which lie to the north, though early maps lumped them into one little-known range. Mile 16.5. GPS. 32°26’14.0”N, 114°15’34.7”W. Southern tip of Vopoki Ridge. Continue straight (northwest) at sign A-9. Rescue beacon for border-crossers and migrants who may be suffering thirst or heat exhaustion...the next phase is death. Attention! You cannot walk to safety from this point! You are in danger of dying if you do not summon help! ¡Atencion! ¡Si continuas mas lejos de este punto, no podra llegar a un lugar seguro! ¡Si no llama por ayuda, esta en peligro de morir! Agents take these calls seriously and check the beacon regularly. As you go… Miles 16.5 to 16.8: Possible campsites, with interesting plants on slopes. NO hiking west of road due to laser hazard area. Those signs about unexploded ordnance and lasers in use? What they’re really saying is, “Survivors will be taken to jail.” One author is sketching the plot to a novel about a desert hiker who crosses that line and is blinded by a laser beam, so he must wander alone through the sands, feeling his way through the cactus forest and…. The story does not have a happy ending. Mile 19.8. 32°28’15.3”N, 114°18’03.9”W. Information marker for Yodaville, a simulated urban combat village (Urban Target Complex) used for training pilots and aircrews in urban tactics. The village can be seen to the west. Yodaville is a live-fire area. Observe all warning signs. All of them. “Closed to the public” and “Danger” mean what they say. Yodaville is constructed from shipping containers to replicate a town, complete with painted doors and windows, vehicles, and mock infrastructure. Built in 1999, its nearly 200 buildings are made of surplus cluster-bomb containers (stacked like legos), steel shipping containers, and lumber, with faux trees, roads and powerlines, vehicles, and even a fake soccer field. Designed to simulate close ground support of troops by Marine Corps aircraft, it is a highly dangerous live-fire area, with hazards from bullets, practice bombs, unexploded ordinance, and lasers. Named for USMC Major Floyd Usry, who proposed the concept after serving in the 1993 hostilities in Somalia. His pilot call-sign was Yoda, presumably after the Star Wars character. Aircraft you may see include the V-22 Osprey, UH-1Y Venom helicopter, AH-1W Super Cobra, FA-18 Hornet, AV-8B Harrier II, and F-35B Lightning II. Ooh Rah. Mile 20.1. 32°28’26.1”N, 114°18’14.0”W. Trail to Spook Canyon. Sign A-8 set in pyramid of rocks. 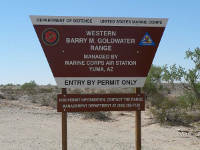 The Goldwater Range-West range management office (RMO) handles environmental and public issues, and in its early days range managers Ron Pearce and Don Little (call-sign “Big”) made range signs in their home garages on weekends. Today the office has a dozen employees, including range wardens who patrol the 2,800 square kilometers of desert. Mile 22.4. Raptor nest in saguaro west of road. Mile 23.1. 32°30’22.8”N, 114°20’23.9”W. Junction A-7. Continue straight ahead. Side trail goes east to a rescue beacon. Miles 23.4 to 23.6. Gravel flats here are fairly bare, with ironwood and paloverde trees in small runnels. Mile 24.2. Administrative trail west to “Bootleg.” No public access. Mile 24.4. 32°31’25.3”N, 114°20’52.0”W. Major junction. Sign A-6. Sign shows Camino del Diablo going west (left). Continue straight (north) for Fortuna Mine. 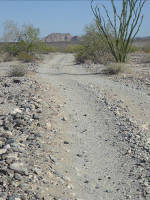 Or for a smoother but less scenic trip to Yuma, take road to west as described in Alternate route to the west. Fortuna road is rocky and rough. Mile 24.6. Road narrows and becomes rocky, giving it the feeling of a real backcountry road. Bare rocky slopes add scenic look when contrasted with lush growth along washes. Mile 25.4. 32°32’11.1”N, 114°20’47.7”W. Sign A-6-A. Tricky turn: go left at tip of rock ridge – do not go east (right) into open area. Note distinctively bedded rocks. The Gila Mountains have a very complex geology, beginning with the many faults and intrusions into the Mesozoic gneiss and schist in the north and granite in the south. One of the wildlife waters in the area is named Geology Divide Tank in recognition of the geologic distinction. Drainage bottoms (washes, arroyos) are rocky here, but note the driftwood and flotsam in trees. Despite infrequent rain storms, the runoff can be high, swift, and powerful, and a vehicle is no match for running water. Miles 26.3 to 27.1: Danger! Open mine pits and shafts. You are entering the Fortuna mining district. Mile 26.8. 32°33’11.0”N, 114°20’04.2”W. Center of Fortuna Mine complex. Sign B-7. Site of mining company’s general store, which also housed offices. A two-mile interpretive trail invites you to explore a unique gold mining town, brought to life through informative signs with historical photos. The Fortuna gold mine in the northwestern Gila Mountains operated intermittently from 1893 to 1926, employing 80-100 workers during its peak. Workings consisted of two inclined shafts, one 1,100 feet deep, the other 359 feet deep, with lateral work at various levels. The lode’s quartz vein ran through Pre-Cambrian schist and gneiss intruded by granite, amphibolites, and numerous dikes of pegmatite and aplite, all of which have been heavily faulted. The original production shaft was located on a low hill – called Mill Hill – about 250 feet southwest of the main vein outcrop and was inclined 60° to N034E (degrees clockwise from north). The fence around the shaft was placed there a few years ago to protect visitors from falling in and to keep vehicles from being pushed in for insurance claims or because they had been stolen. They were hard to get out! Charles D. Lane, principal developer of the mine, bought it in 1896 when he was also a major stockholder in the Harquahala (or Bonanza) Mine near Salome, Arizona, which was running out of ore at the time. Most of the mining crew at Harquahala was transferred to the new mine at Fortuna, where the company built the mill and laid a four-inch water pipeline more than 12 miles to a well on the Gila River’s flood plain near Blaisdell. Living conditions were primitive and temporary; it was a mining camp, not a mining town with amenities, schools, and churches. Turn east (right) at B-7 to see more of the Fortuna site. On the slope to the east stood a 20-stamp mill operated by steam-power, and a 100-ton cyanide plant treated the tailings. Native wood, especially ironwood trees from Woodcutters Canyon, was burned for fuel. Total production amounted to $2.6 million, or 124,239 ounces, with almost all of that occurring between 1896 and 1904. One novel feature at the mine was the use of three water catchments – cisterns, really – that harvested rain runoff, stored it in sumps in abandoned drifts, let it purify by putrefaction over several months, and then served it for use. The largest “water catch” held 15,000 gallons when full. The depleted mine workings partly filled with groundwater and in 1929 the shafts were caved at the surface. The land is now withdrawn from all mining. For further information on the mine and its geology, try “Geology of the Fortuna Mine, Yuma County, Arizona,” a 1999 open file report (97-16) by the Arizona Geological Survey. The site is eligible for listing in the National Register of Historic Places. Continue north at B-7 for Yuma. Mile 27.4. Sign B-6. Campsites to the west on overlook. Mile 28.3. Two fascinating desert phenomena are obvious along the road. One is desert varnish, a natural process where a thin, shiny coating is formed on exposed rock surfaces by an interaction of microbes with clay, oxidized manganese, and oxidized iron over many millennia. 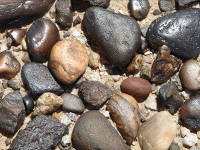 The second is desert pavement, a natural flat stony surface that may be many tens of thousands of years old. Mile 29.3. Out of the mountains and into washes. Though it is difficult to believe while standing in the heat on parched ground, these rocks have been eroded, rounded, and moved by running water over several million years in floods, debris flows, and at times live streams. Note road-cuts that show layers of similar-sized rocks several feet deep. Mile 29.4. 32°34’23.6”N, 114°21’59.3”W. Sign B-5 and trail to the west. Continue straight. Mile 30.0. Big wash with big trees. Mile 30.4. Flats of “varnished” rocks, chemically darkened over time with a natural patina. Many of the smaller rocks have been tumbled and rounded by running water or wave action, and are not sharp edged. How could that be? The Gila Mountains, once much larger, are block-faulted and are typical of mountains in the Basin and Range Province. Within the past 5.5 to 4.5 million years, rifting and subsidence created the proto-Gulf of California and Salton Basin as well as a shallow inland sea that reached as far as modern Phoenix, Arizona, and Las Vegas, Nevada. It surrounded the Tinajas Altas and Gila mountains, which have since risen relative to sea level. So “way back when,” you could have camped along the western flank of these mountains and enjoyed a sunset at the beach. Mile 30.8. Sign B-4. Junction. Take the road to north (straight ahead). Road to west (left) angles to Foothills Boulevard. Mile 31.1. Sign B-3 and trail to northwest. Continue north. Mile 31.4. Sign B-2 and trail to the east. Continue north. Mile 32.6. Sign B-1. Continue north. Mile 33.6. 32°37’35.9”N, 114°22’31.2”W. Goldwater Range northern boundary. Corner of 56th Street and South Ave 15E. Sign post B. Take paved road north to the highway. Mile 34.8. Golf course and ponds. Mile 35.8. 32°39’37.3”N, 114°22’31.3”W. South Frontage Road and South Avenue 15E. Go west (left) to Foothills Boulevard and Interstate 8 interchange. Mile 37.2. 32°40’02.1N, 114°23’55.4”W. Fortuna Wash and bridge. Many early travelers probably followed Fortuna Wash to the Gila River. El Camino del Diablo (The Devil’s Highway). Early day route from Sonora to California over the path taken by Father Eusebio Kino in 1700 when he sought to discover if California was part of the American mainland. 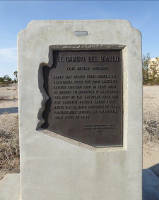 The parched desert along this route has claimed hundreds of lives, particularly during the California Gold Rush of 1849. Mile 37.9. Foothills Boulevard and Interstate 8 interchange. Few services. Continue straight (west) on frontage road or Interstate for Fortuna Boulevard and services. Mile 43.3. Fortuna Boulevard and Interstate 8 interchange. Many stores and services. Add air to your tires if needed. Congratulations! You have survived El Camino del Diablo.